One of the major reasons why Android enthusiasts opt to purchase a Nexus device are the guaranteed updates. At its Google I/O conference way back in 2011, Google initially tried to get its partners to provide software updates for their devices for at least 18 months. While many devices unfortunately received the cold shoulder when it came to the latest flavor of Android, for the most part Google kept its own promise and provided quick software updates for most Nexus devices (we’re pretending that the Verizon Galaxy Nexus never happened). Over time, Google has refined its update policy to be more transparent to the end user starting with the introduction of the Nexus Security Bulletin (now known as the Android Security Bulletin) last year. With this announcement, Google began rolling out monthly security patches to all of its Nexus devices that are promised to continue for the longer of 3 years or 18 months after the device is delisted from the Play Store. Additionally, Google promised to provide major Android version OTA updates for 2 years after the device’s initial launch. While the security bulletin was a major step forward in encouraging Android OEMs to provide software support for their devices, one major issue remained: when exactly will software support end for a device? 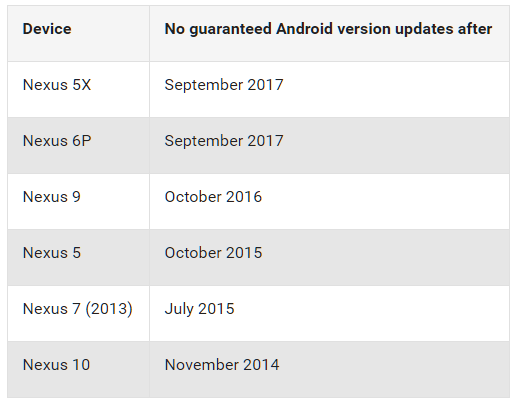 For those of us who would prefer a more exact timeline, Google has just published a table indicating the end-of-life date for certain Nexus devices. Oddly enough, the table is missing entries for the Nexus 4 or Nexus 6, though in the Nexus 4’s case the device is long past its end-of-life date and for the Nexus 6 its support will end in about 5 months. This is the final date after which your device is no longer guaranteed to receive a major Android software update. If you’re looking to taste whatever the latest flavor of Android is poised to be released after your device has reached the end of official Google support, you’ll have to head over to our forums and flash a custom ROM. Remember though that you will still be receiving monthly security updates for your devices so long as you’re still within the eligible time-frame, and maybe a regular update or two if history is to repeat itself. We’re hoping that Google will provide official end-of-life dates for when they will no longer provide security updates as well. Finally, and this one is a long-shot, here’s to hoping that OEMs will follow Google’s suit in providing us with a roadmap of when their devices will be left in the dust. 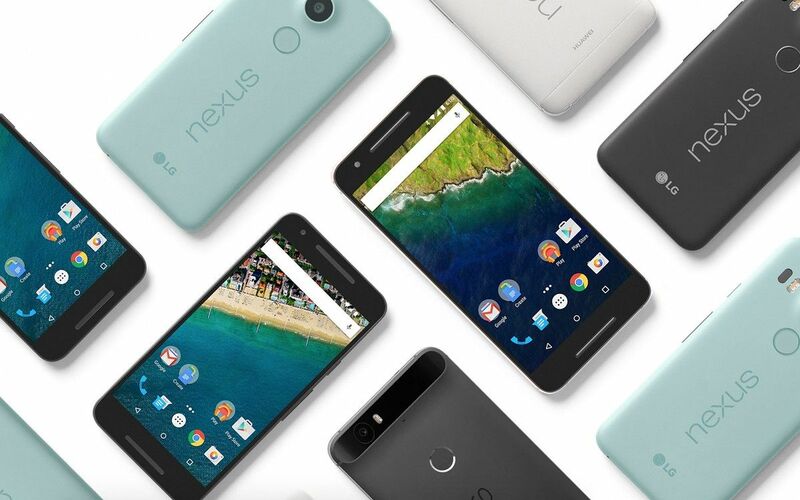 Do you plan on upgrading before or after your Nexus reaches end-of-life? Or do you plan on keeping it and flashing a custom ROM? Let us know your thoughts below! Source: Google Support Page. Via: Reddit.